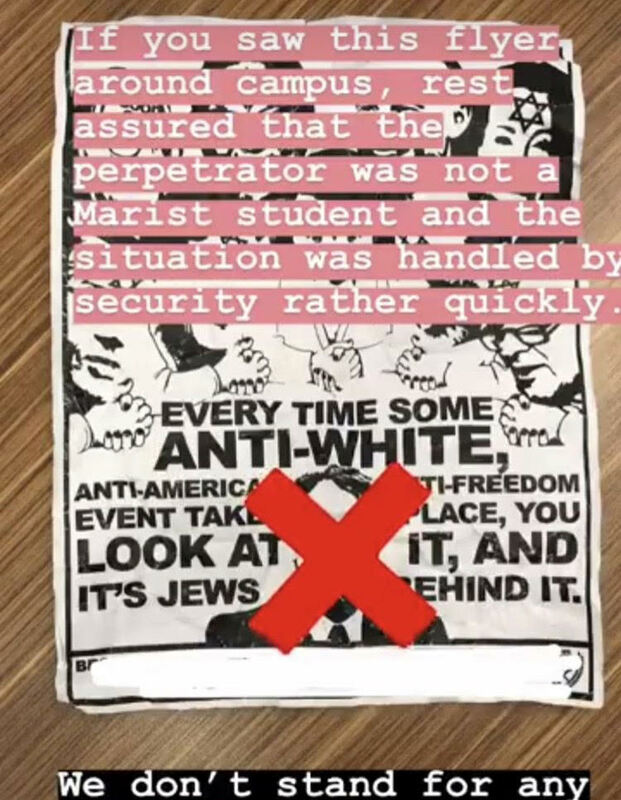 Marist College Safety and Security responded to reports of anti-semitic fliers plastered to the walls of two academic buildings, Dyson Hall and Lowell Thomas, Monday night. The fliers blamed Jews for the sexual assault allegations brought forth against Brett Kavanaugh, the recently appointed Supreme Court Justice. “Every time some anti-white, anti-American, anti-freedom event takes place, you look at it, and it’s the Jews behind it.” A picture of Justice Kavanaugh overlay the text, as well as caricature drawings of a number of politicians and individuals, including two Jewish members of the US Senate, depicted with the Star of David on their foreheads. Dr. Christine Blasey Ford, who accused Kavanugh of sexually assaulting her, is illustrated with the words “Good Goy” on her forehead. The individual later told Marist Safety and Security officers that he had disseminated the speech “with the intention of educating people,” according to Director John Blaisdell. Upon receiving an email from a professor notifying the department of the fliers, Blaisdell said he sent officers out to investigate. Around the same time he processed the report, Blaisdell received another call from a student suspicious about an individual walking around the campus. The student, whom Blaisdell declined to name, described the individual as “somebody walking around with a satchel, a hoodie, dark rimmed glasses…perhaps wearing gloves.” The report also described the person as a white male who looked to be in his early 20’s. After removing the messages from the walls, safety and security officers identified a man who fit the description in the report. “[The officers] approached him and asked to talk to him; initially, he wasn’t interested in talking,” Blaisdell said. “Eventually, they had a conversation, and we summoned the Town of Poughkeepsie Police.” The police department is currently addressing the situation. “Our initial response to the man is that he is not welcomed on our campus,” Blaisdell said. Safety and Security subsequently learned from police that similar incidents of anti-semitic speech were reported at both Vassar College and Dutchess Community College earlier in the day. Media outlets have also reported sightings of these fliers at the University of California campuses at Davis and Berkeley. Blaisdell notes the anti-semitic fliers as “the first time anything of this gravity has happened” in his experience at Marist, and he later sent an email to students notifying them of the situation. “We are thankful to the students and staff that brought this to Security’s attention in such a timely manner, allowing us to locate and identify the individual. We will continue to work with our neighboring colleges and institutions, local law enforcement and federal law enforcement to keep our campus safe,” he wrote. The incident appears to follow a national trend that shows a dramatic increase in reports of bigoted messages circulating college campuses within recent months. During the 2017-2018 academic year, the Anti-Defamation League reported 292 new cases of racist, anti-semitic, and anti-immigration messages disseminated by white supremacist groups at colleges and universities across the nation. The number marks a 77 percent increase from the previous year. According to the report, the speech often came in the form of stickers, banners, and other physical material and often targeted Muslims, non white immigrants, and L.G.B.T people. Bigoted messages are considered protected speech under the First Amendment so long as they are not identified as hate speech, presenting an imminent danger to society. But private institutions reserve the right to remove messages distributed on their property that invoke hatred against a group of people or run counter to the college’s core values. The anti-semitic flyers generated widespread condemnation among student leaders at Marist, including Student Body President Ted Dolce. Student Body President Ted Dolce condemns messages in Instagram Story post. Rabbi Boruch Zelouf, the chabad rabbi that serves Marist students, also spoke out about the bigoted message. He went on to invite the Marist community to a Unity Shabbat dinner that will take place this Friday night. “Let us join together collectively to show that hate has no place here,” he said.